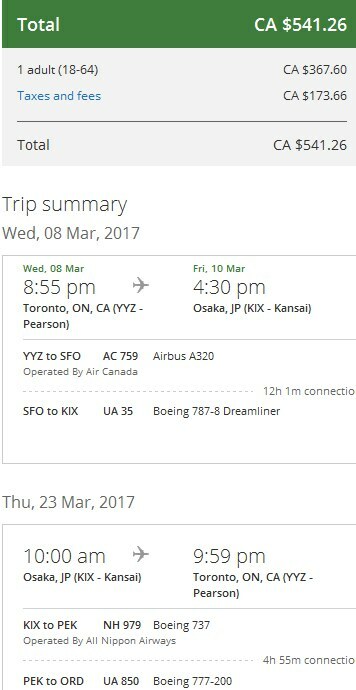 Those crazy prices from Toronto to Osaka, Japan are available again on United Airlines for $541 CAD roundtrip including taxes. This time, the flights are available for travel in February, March, and April 2017. Look for the flights that are showing as $698 CAD roundtrip including taxes. You may need to click on a departure date before seeing the $698 flights. 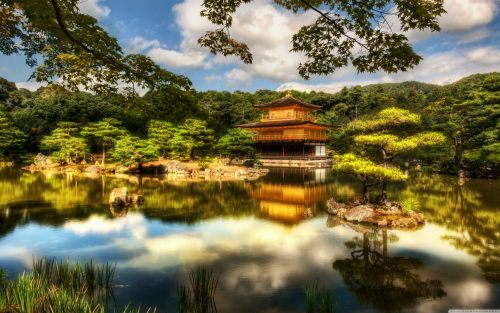 toronto, yyz, flight deals, asia, japan, east asia, united airlines, osaka, kix and kyoto. 16 Responses to "Toronto to Osaka / Kyoto, Japan - $541 CAD roundtrip including taxes"
For cnx in China (like in above example) would Canada Passport holders need any type of visa? I found the flights on google flights, but I'm having some trouble with United. I'm using the same dates, but not seeing the same fares. Is there something I'm missing? Update: Some people are reporting that they've had better luck finding/booking this deal using Google Flights on a mobile device, as opposed to a desktop or laptop. Have the prices changed or all sold out? I am unable to find any flights with that low of a price. I booked it through search from google flights, reservation went through but never received a confirmation email. Called UA, turns out that the segment from YYZ to SFO provided by Air Canada was not confirmed by AC. It is not a seamless process. AC has 24hrs to accept/decline the reservation. 17hrs has passed, still not confirmed. I ended up cancelling the reservation. Don't waste your time on this deal. Um has anyone got further information from UA aside from the initial email? I called them last but hung up while on hold while waiting to be transfered to someone that was going to explain to me whats going on. Sounded like they were going to reneg.. Ya, I booked during this deal. Got itinerary after about 26 hours. Lots of people had cancellations, called and complained and got their flight back. Don't give up! No complaint needed. Some sort issue with Air Canada. 25 minutes on hold solved it... Japan I'm coming back again! Today Japan announced more economic easing Yen to drop down! 14 hours layover in San Fran. I tried calling United and they said that the flight cannot be confirmed. Called Air Canada and they said the flight is cancelled. They (AC) advised me to talk to the travel agency. Who did you talk to Jeff (AC or United)? And what exactly did you say to them? Maybe they provided you a different option from the one you had reserved? Anyways, hope you have a pleasant trip. to anyone having issues with the first segment by AC not being confirmed, don't bother calling AC, they cannot help you. my friend and i resolved this by calling up UA and explaining the situation and asking for a UA flight out of YYZ. UA may be able to talk to AC but you'll have to wait 24hrs for a confirmation and it's no guarantee, so we just cut out AC and are using UA for the entire trip. our flights was amended with no extra charge and you may have a small extra layover at either Washington or Chicago but the 12hr layover at SFO can't be avoided it seems. I booked last week, but still hadn't had my tickets/itinerary issued. I called them yesterday, and the first woman I spoke to tried to convince me to cancel and rebook. (I insisted I absolutely did not want to do that because it would cost twice as much!) She then tried to make changes to my itinerary and told me the new total was almost twice as much. I kept politely affirming "I am flexible in terms of dates and in terms of stopovers of pretty much any length, but I insist the price not change." She insisted it was impossible because AC cancelled their portion, and it was out of their control. I then escalated. The second person started ACTUALLY solving my problem (A different itinerary at the same price) immediately, but all and all I was on hold or "arguing" about 2.5 hours. So set aside quite some time to call them. Then ignore any insistence that they can't help you. Be polite but firm and escalate as many times as needed. I started a recording and planned to advice the agent of my recording if things started to go bad. This was not needed in my case. Def no point calling AC. All I said was "I made a rez 2 weeks ago, haven't been charge yet and no itinerary. What's going on?" Had they given me a problem with the ac flight I would have told them to fly me via UA. Like above.